Originally I was going to follow the news pattern that the other factions used, however I will admit that takes too long. Instead of doing that I will switch to small updates like this one, this might even help to convince a few people that I have not given up on this. 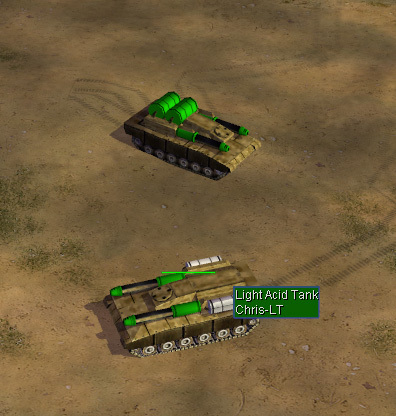 These two units will be the first chemical units available to the player. After upgrading to Escalation 1, these units will be available for purchase from the motor pool (and available to both techs). These function in basically the same way, they each have a sprayer that sprays toxins/acids at the target. Both units have weapon upgrades that will be disclosed at a later time. Note: The house color on the chemical barrels of the Light Acid tank has been fixed, however I didn't take a new screenshot. 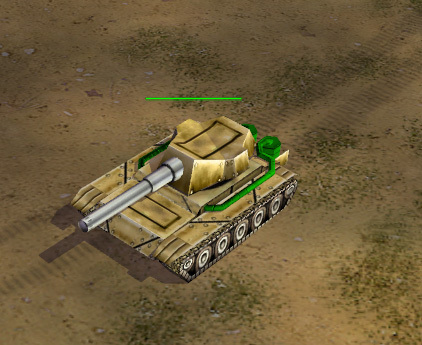 The first chemical based artillery available to Chem, and a dangerous one at that. The canister artillery fires shell that does no damage but leaves a chemical cloud behind. The shells can be toggled between toxin rounds and acid rounds, however only the weapon tech you choose(toxin or acid) will recieve any upgrades. This is currently available after construction of the Palace.